Found this via utsapocalypse. 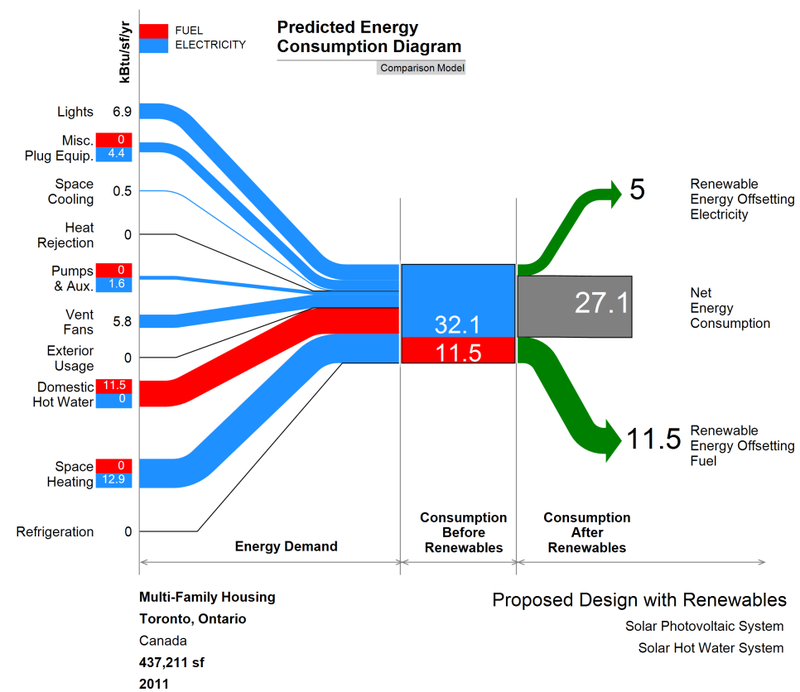 The Sankey diagram is originally from the article ‘Preliminary Investigation of the Use of Sankey Diagrams to Enhance Building Performance Simulation-Supported Design’ by William (Liam) O’Brien of Carleton University, Ottawa. 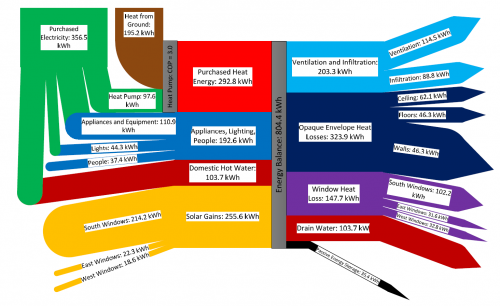 The Sankey diagram shows the energy balance of a house for a mid-winter week. Flows are in kWh, total amount 804 kWh. 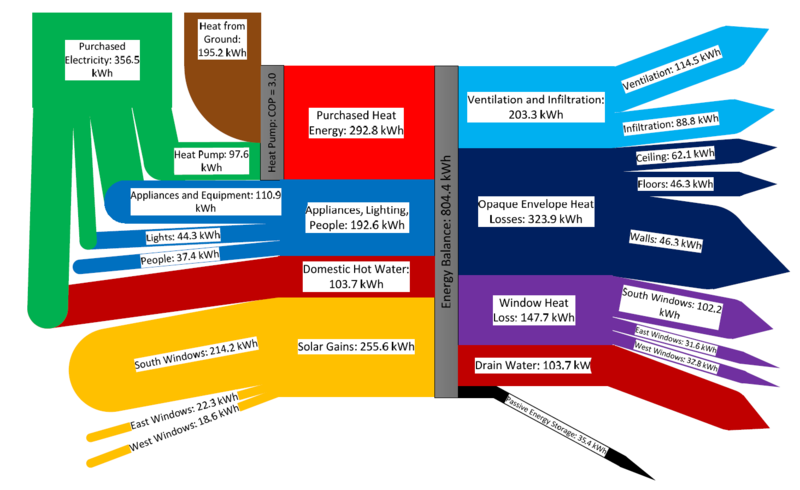 Energy sources/types are from the left (purchased heat, domestic hot water, solar gains), energy consumption and losses to the right (heat loss through windows, ceilings, walls). Plenty of colors used in the diagram, Sankey arrows glued together from shapes. As the author mentions “the underlying creation process, when performed manually, can be quite complex”. Premnath Sundharam from the Visualize Green blog contacted me to draw attention to a Sankey diagram template he has made and that is available for download on his site. Last but not least, kBtu/sf/yr is becoming the universal (US) unit of communicating building energy consumption. This unit is called the EUI – Energy Use Intensity and since it is a simulation of how your building will perform, it is called PEUI – Predicted Energy Use Intenisty. Good stuff, Premnath! Thanks for making this available to everyone. Note November 2011: Also look at Premnath’s Energy Story here. The two Sankey diagrams shown along with the article visualize the heat energy flows before and after the optimization measures taken. 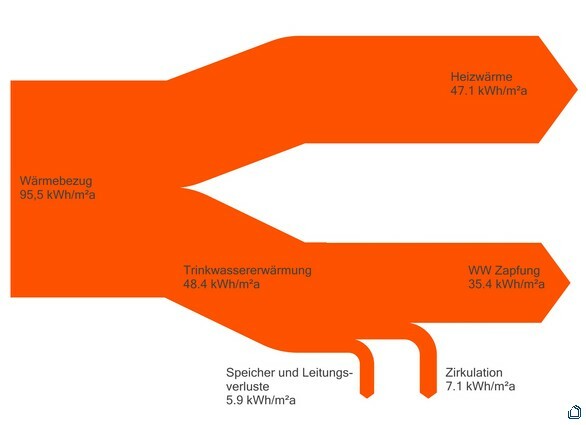 Flows are in kWh per square metre per year. 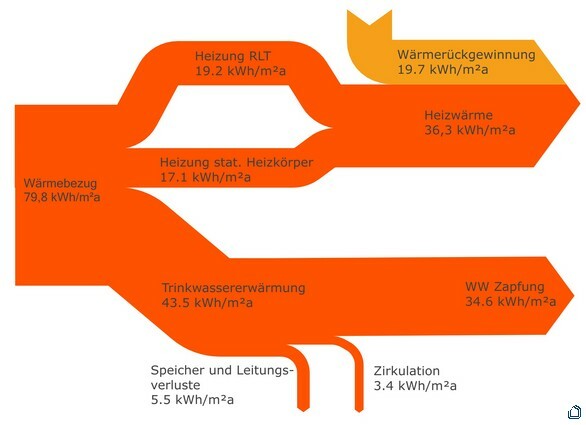 The first diagram breaks down heat consumption into heat used for room heating and for warm water preparation. In the second a new heating system has been installed providing heat mostly over the air circulation system. Only some static radiators remain. [Thanks Thomas for helping me with the translation/explanation]. Apart from the use of a fancy color, the Sankey diagrams are well done and comprehensible. Flows are to scale.